Join us for a Happy Hour Networker November 29th; 5:30- 7 PM, snacks on us. 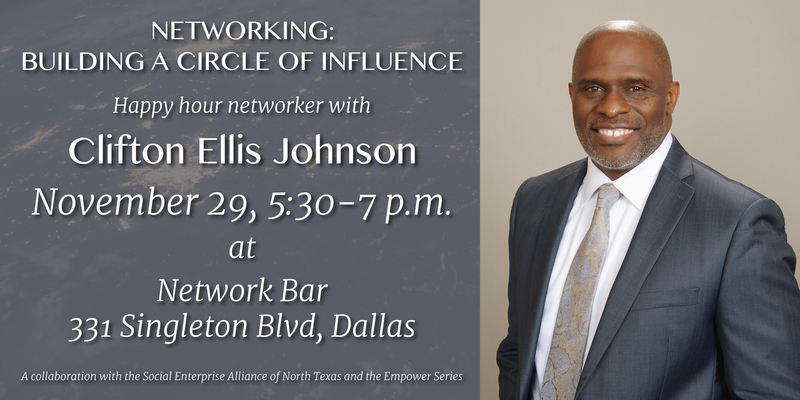 At the Network Bar, 331 Singleton Blvd, Dallas 75212. Three steps to building a fabric of personal contacts that provides you with support, feedback, insight, resources and information to enrich more lives. Presenter: Clifton Ellis Johnson, Founder & Executive Director, EMPOWER Series, Inc.
Clifton is a community servant inspiring people to thrive in every area of their lives. He began the EMPOWER Series movement in 2011. Through live events and digital programs, the EMPOWER Series movement has given hope, inspiration and education to over 150,000 people. EMPOWER Series, Inc. is a non-profit 501(c)3 organization that facilitates financial capability and personal-development workshops, and connects people with resources to achieve their goals. Clifton has over 35 years of experience in wealth management, accounting, and executive leadership in the non-profit, financial services, telecommunication and natural gas industries. He was a Wealth Advisor for USAA Investment Management Company, J.P. Morgan Chase and Ameriprise Financial Services. He also served as a Senior Consultant for Senn-Delaney Leadership and Vice President & Controller of Energas Company (A division of Atmos Energy Corporation).